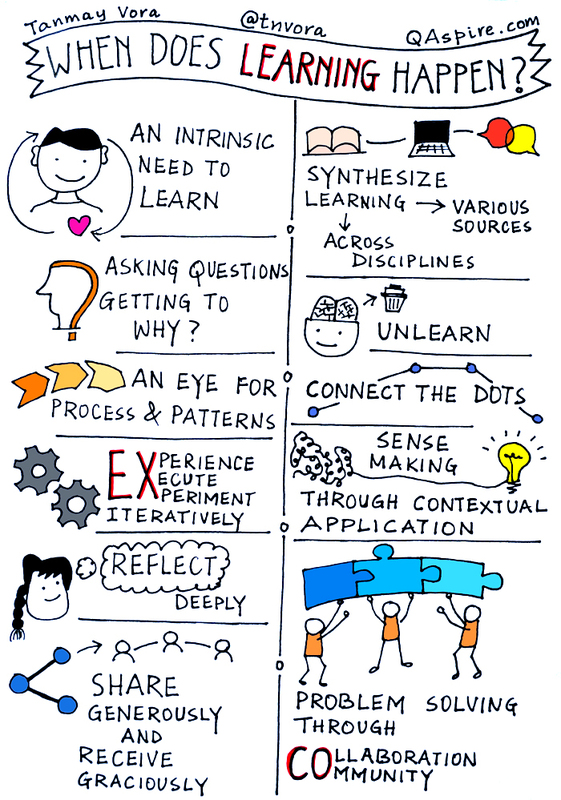 Tanmay Vora (@tnvora) has two very nice sketchnotes and associated articles on learning. 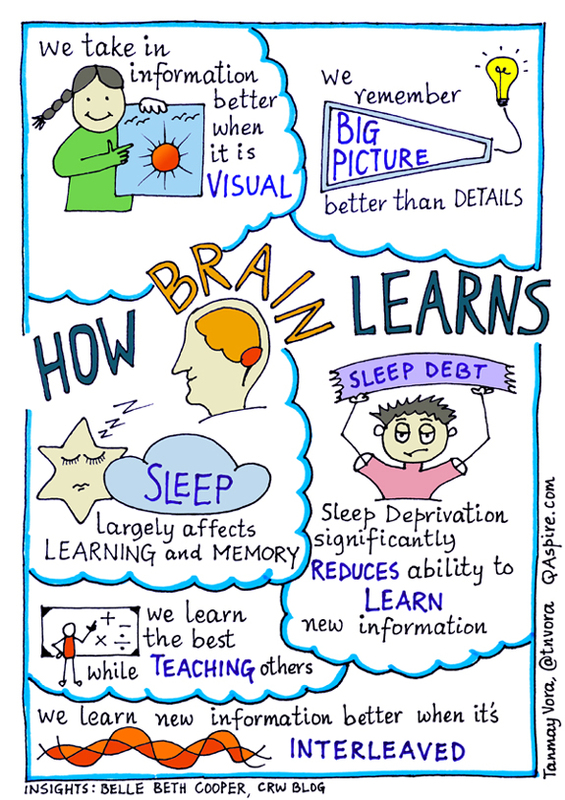 I was especially struck by the bottom of the sketchnote that says We learn new information better when it’s INTERLEAVED. This may be a new term to many and it is a fairly new idea in terms of educational research. Scientific American had a nice article in August 2015 on this (http://www.scientificamerican.com/article/the-interleaving-effect-mixing-it-up-boosts-learning/). The article talks about math quite a bit. There are numerous links to research and other articles. It contains many good points, including two reasons why interleaving strengthens memory associations. Put simply, interleaved learning is when students practice in an ABCABCABC pattern rather than (in blocks) AAABBBCCC. As a teacher, I have long been an advocate of mixed practice. Interleaved learning is related to, but not equivalent to, Distributed Practice. Give interleaved learning a try. I like to use the following story of a parent interacting with their 3-year-old to make a point. The principle I’m illustrating is the technique the 3-year-old is already using. He wants to know how the world works. As humans, we an an innate desire for things to make sense. We an an innate desire to know why. 3-year-olds do this instinctively. Unfortunately, sometimes people loose this desire to ask why. Notice how the technique is used. The child did not just ask why once. As the parent and child play this game, the parent knows that this will only end when the answer is something that is inherently true, foundational (so the parent is trying to work to an answer that is so obviously true that the why-asking can end). In mathematics (and school in general) we should always ask Why — and we should ask, in response to each answer, why again. In this way we often work our way to foundational truths – which are very important truths. Furthermore, connecting foundational truths to today’s problem adds powerful connections in the brain. After you solve a math problem, in the Look Back and Extend phase (among other things) ask WHY. This is a nice infographic on terminology. Validity, positivism, etc. There is a good list of sources at the bottom of the infographic. A couple years ago, I made a fairly extensive page on research, titled, Math Education Research and a Plethora of Committee and Government Reports. With this website coming on board, I probably won’t be editing that page much (we’ll see). I will probably make this site my main workhorse when it comes to Math Education Research and the like. This is pretty (OK, quite) negative on technology. I don’t think it claims (or the reader should conclude) that all technology is bad. It offers some very realistic concerns. The article is fairly extensive.